In this blog post, I will try to create an example demonstrating the usage of singleton pattern. In this code, I just have a simple for loop to imitate tasks coming in. For every task, we get the LoadBalancer object and assign the Server to it randomly. For this example, you can argue that we could have achieved the same result by declaring the LoadBalancer object outside the for loop. That is true, but that is not the point of this demo. The point here is that singleton pattern is proactively stopping any new instances being created. Let's take a look at the LoadBalancer class now. The class is sealed so that it can not be inherited. Then we define a LoadBalancer instance as private and as static. If you don't define it a static then its not thread-safe. The class also has an ArrayList of servers and a Random object. The class also has a private constructor which just adds the servers to the ArrayList. Private constructor makes sure that class can not be initialized outside the scope. The GetLoadBalancer() method returns the one and only instance. There is no other way to get hold of this instance. 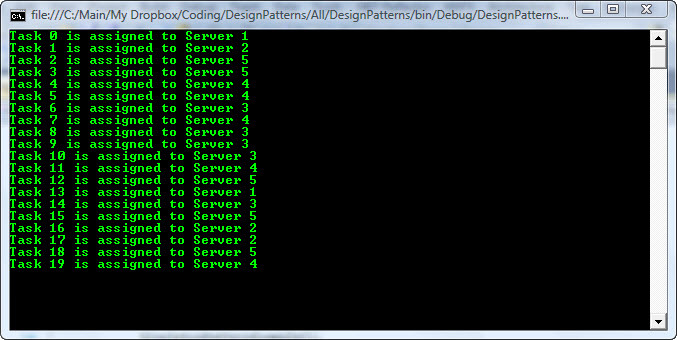 And lastly, the simple Server property does the main work of finding out a Server and then notifying it to the caller.